Twelve youth teams, twelve nations. The pathway to professional sailing. What a thrill to be selected to sail a AC45F foiling catamaran representing your country during the 35th America’s Cup. That’s a lot of responsibility for sailors between 18 – 24 years of age but the rewards are great. When the program was first introduced in 2013 the youth sailors showed great talent and were quickly snapped up by 35th America’s Cup teams. In total eight Red Bull sailors from the 2013 competition are now with AC teams. Most notable are Peter Burling, helmsman with Emirates Team New Zealand, and Blair Tuke, his Olympic gold medal teammate. They were both on the New Zealand team which won the Red Bull Youth Challenge in 2013 and now sail on the Kiwi AC Team. What a great way to infiltrate the close knit, and often cliquish, world of professional sailing. The Red Bull Youth America’s Cup was the brain child of Hans-Peter Steinacher and Roman Hagara, double Olympic Gold Medalists and sailing super heroes in Austria. Jimmy Spithill, USA Team skipper, was also a key figure in the bringing the project to fruition. Together they partnered with the America’s Cup Event Authority to stage the contest a second time. The dream for Sports Directors, Steinacher and Hagara was to launch a bigger and better generation of the Red Bull challenge in Bermuda. In particular they wanted the field of boats to be greatly expanded to give more opportunities to sailors from around the world. The current format of the regatta has six teams which are affiliated with each of the countries involved in the 35th America’s Cup. In addition, another six independent teams have been selected from over 20 applications which were vetted by the organizers. Steinacher and Hagara developed an extensive application process for potential teams, selected the best candidates, then had them perform sailing trials. The young sailors had to show they had the ability to handle the demands of the high speed foiling catamarans. By the end of 2016, the top six teams were invited to join the regatta. The field of twelve boats was divided into two groups to race against each other in qualifying rounds. The top four teams from each qualifier progressed to the Final to face off in a six race series. The AC 45Fs were previously sailed by the AC Teams in the America’s Cup World Series. Before transitioning to the Red Bull regatta organizers measured and weighed the boats to make sure they were identical. By the time the youth teams took over the AC45s were equalized to within half a kilo of each other. The youth teams also switched boats between practice sessions so they knew the boats were exactly the same. To ensure an even playing field each team was assigned a seven day training period. When the contest is over the youth teams will have to hand the boats back in the same condition as they were received so they need to know how to handle the complex cats without causing any damage. The Notice of Race states the boats shall be raced with a crew of six persons having a total combined weight of 480 kilos. This is verified the morning of each race day. This is a co-ed opportunity with females participating on the national squads. Annabel Vose sails aboard Land Rover Bar Academy as their strategist. While the learning curve for the sailors was incredibly steep it was obvious the teams were up to the challenge. On race day they showed they had quickly mastered the intricacies and idiosyncrasies of the boats. With everything set up so precisely the expectation was for an exciting and close competition. Both the qualifying rounds and the finals were fleet racing at it’s finest. Lots of luffing duels, tactical moves, barging at the mark rounding and penalties. Group B kicked off the competition and proved how good these young sailors are. At the end of six qualifying races the top three teams all had 51 points: NZL Sailing Team (New Zealand), Land Rover BAR Academy (Great Britain), Spanish Impulse Team (Spain). Home town favorites, Team BDA (Bermuda) in fourth place also progressed to the finals with 45 points. 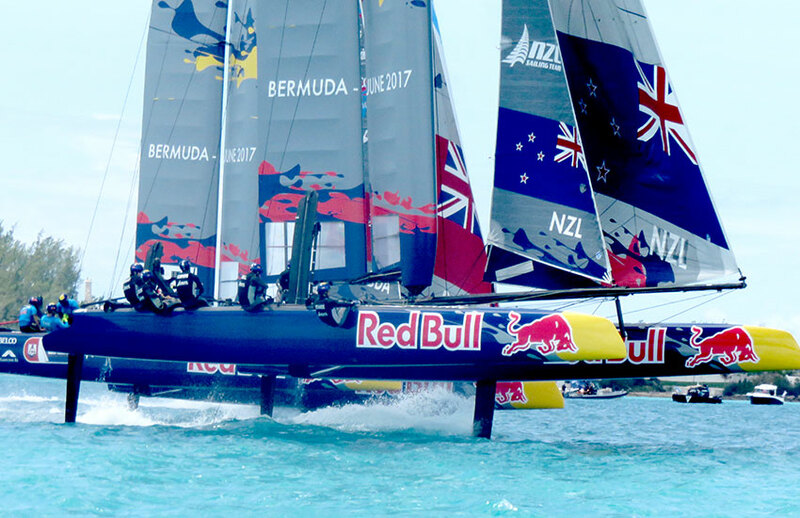 This achievement was remarkable since many of the Bermuda team had never sailed two years before the 2017 Red Bull contest was kicked off. Eliminated from the competition were Next Generation USA and Candidate Sailing Team from Austria. 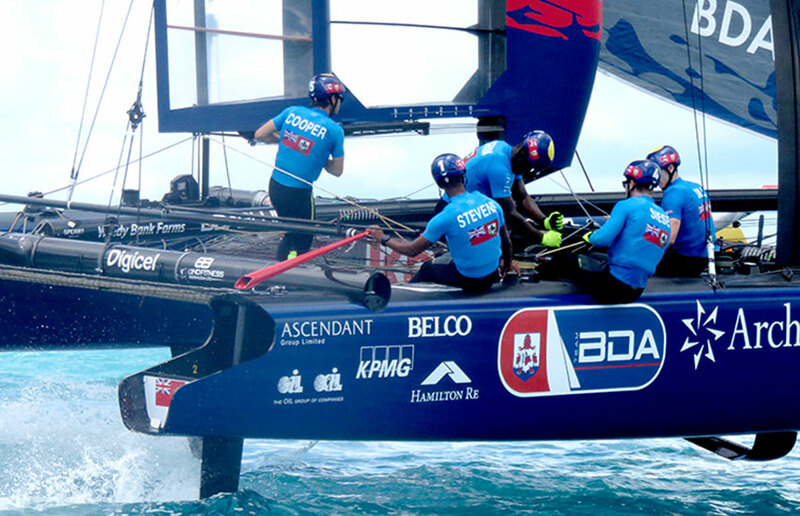 It is interesting to note that ORACLE TEAM USA partnered with the Bermuda team to mentor and coach them. Spithill and other Oracle team members, who had been living and working in Bermuda for over 2 years, chose to repay the hospitality and support they’ve received from this small island nation by taking the home team under their wing. Group A competition was equally intense, particularly in the middle of the fleet. Artemis Youth Racing took four bullets to lead their group with 55 points. The next three places were separated by only one point. SVB Team Germany took second with 47 points and Team Tilt (Switzerland) and Team France Jeune tied with 46 points. Kaijin Team Japan and Youth Vikings Denmark were eliminated at this stage although in the final race of the series Denmark had led most of the way round the course just being beaten in the last seconds by Team Tilt of Switzerland. Going into the Finals it was anyone’s guess who would prevail. Artemis looked really strong as did NZL Sailing Team. All but two of the finalists had finished at least one of their qualifying races ahead of their competitors. Consistency would be the name of the game. Reading the wind shifts and picking the correct side of the course would be critical. There was no doubt who was the crowd favorite: home grown Team BDA. Team BDA did not disappoint. In the first race they got away early, crossed the start line ahead of Spanish Impulse Team and rounded the first mark in front of the entire fleet. The roar from the crowd in America’s Cup Village was probably heard all the way across the Great Sound. They sailed a perfect race, once ahead with clean air they kept the lead until the finish line. What a terrific start for a novice team made up of athletes from a mix of sports. They made Bermuda proud. SVB Team Germany started over early and had to drop back for a two boat length penalty. From that point on they were sucking everyone’s bad air and could not recover. Land Rover BAR Academy sailed a strategically smart race and on the run to the finish moved ahead of Spain to finish in second. In Race 2 it was NZL Sailing Team who were too eager at the start line and suffered a penalty. Also Team Bermuda did not give room at a mark rounding and were penalized. Mistakes such as these are impossible to recover from. Team France Jeune sailed a clean race and finished first ahead of the very steady British team. At the start of Race 3 the wind had picked up to around 10 knots. Still not enough to get the boats foiling but enough for one hull to lift out of the water. Land Rover BAR Academy got off the start line first and never looked back. They led the entire race finishing ahead of NZL Sailing Team and Artemis Youth Sailing. The next group of three boats were mixing it up at the final gate rounding. Germany got too close to Team Tilt and the Swiss called for a penalty which the Umpires granted. In the meantime Team BDA was bearing down towards the finish on a hot line. The crowd were hoping for a last minute end run but there was just not enough time. They finished in sixth place. Overall standings at the end of the first day of finals proved consistency paid off big time. Land Rover BAR Academy, with two seconds and a first, led the leaderboard with 28 points. 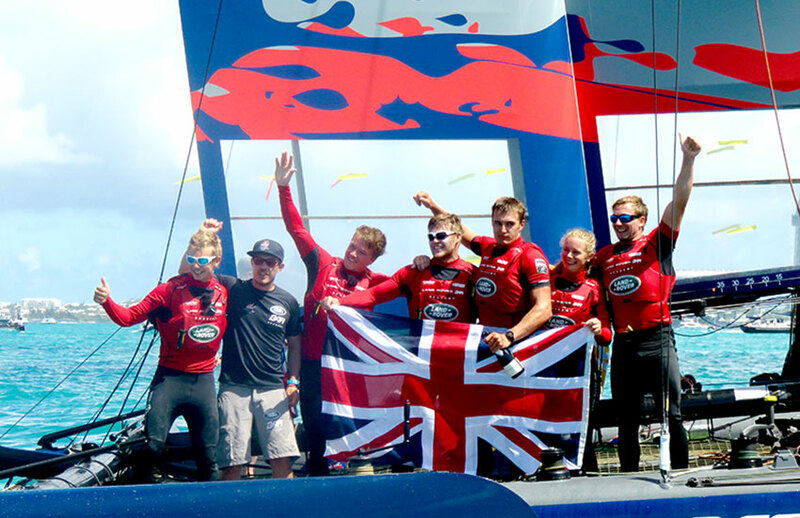 Rob Bunce, Skipper of the British Team said confidently, “Our game plan going in was to finish in the top three of each race. We achieved our goal”. Team Tilt (Switzerland) and Team France Jeune tied for second place with 21 points. Artemis Youth Racing was close on their heels with 20 points. NZL Sailing Team and Team Bermuda finished the day tied with 18 points. Spanish Impulse Team and SVB Team Germany each had 15 points. The Germans are in a unique situation with three brothers sailing on the team. Unfortunately the close family ties did not bring desired results. Second day of racing brought wind in the 8 -10 knot range. Not quite enough for foiling. The key to winning would be all about the starts and tactics. So far Anabel Vose with Land Rover BAR Academy had done a great job for the Brits. Could she do it again? Day two of the Red Bull Youth America’s Cup definitely belonged to the NZL Sailing Team. New Zealand came out hot and nailed every start. They dominated and looked invincible. The stats showed they were definitely the fast boat on the water plus, as the wind picked up later in the afternoon, they were able to pop up on foils in the last race. At the end of the day they had three bullets. It looked like they were all set to reclaim the Red Bull title for the second time. Throughout the second day the rest of the teams had been mixing it up at the starts and at the mark rounding. Land Rover BAR had an over early in the first race and were not as consistent overall. Team Tilt (Switzerland) were holding their own in the middle of the fleet doing well. They were being cheered on by a large crowd of cow bell ringing Swiss fans. Artemis had moments of brilliance but incurred a penalty in the first race which doomed them to the back of the fleet. In the last race of the day Artemis were in second place until the last mark rounding when they barged in forcing SVB Team Germany into the mark. Germany was skewered on the mark and dead in the water, Artemis received a penalty and had to slow down two boat lengths. While the two boats were wallowing at the last mark, Land Rover BAR saw their opportunity to sneak by. Coming from fifth place they overtook three boats to finish second behind NZL Sailing team. An unbelievably exciting and dramatic finish. They had won the regatta. These young men and women are the next generation of super sailing stars – keep an eye out for them in the future.